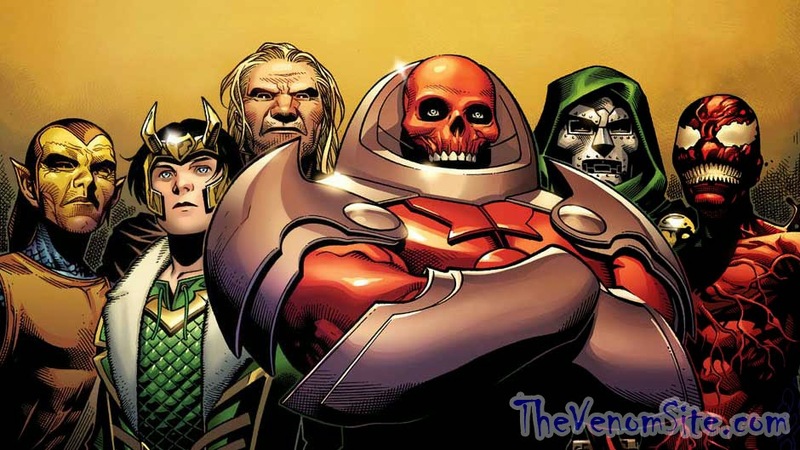 If you have been paying attention to the current Marvel event, AXIS, then you would know it has been filled with ups and downs of characters and inversions of villains you would have never expected to see turn face. 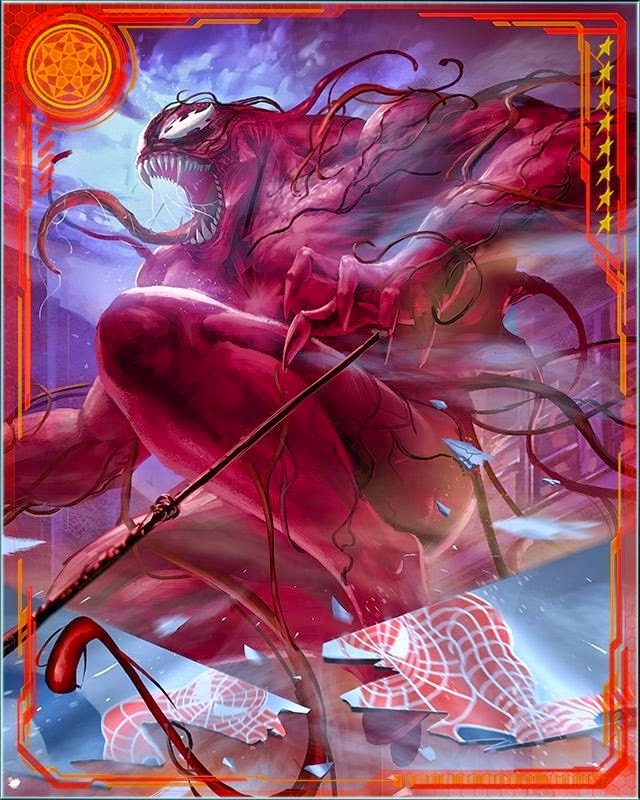 Carnage recently became one of these new "heroes" and his witty comments and actions have lead him down the path of what most of us Venomaniacs love to see as a new form of the Lethal Protector. The vibe that Cletus gives puts us back into the '90s nostalgia that the limited series with Eddie running around in San Francisco made us grow to love. 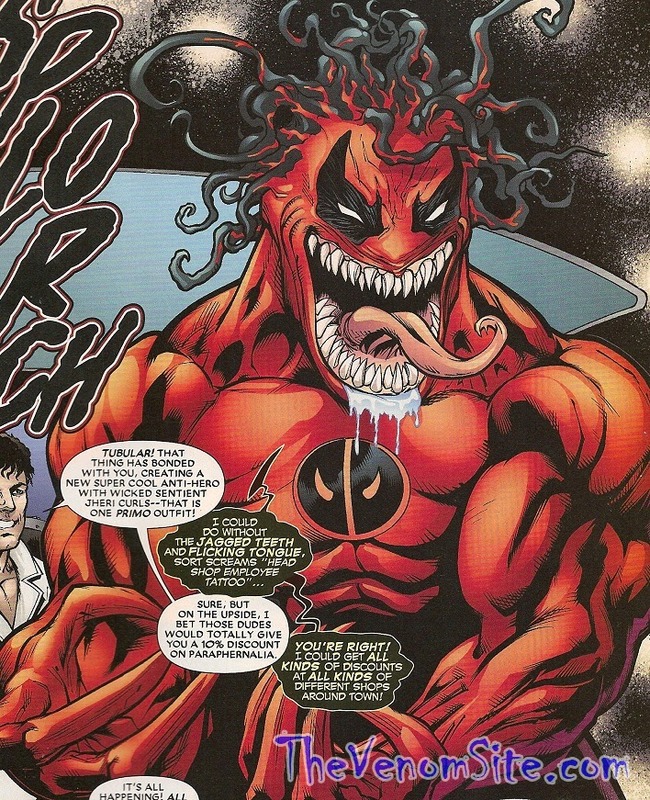 In my opinion, I hope they keep this inversion for Cletus for a while and we could possibly see a Venom and Carnage team up once again, or even better: a Toxin and Carnage team up. After considering the events in AXIS #8, I have become worried about the future of our friendly neighborhood Carnage-man. 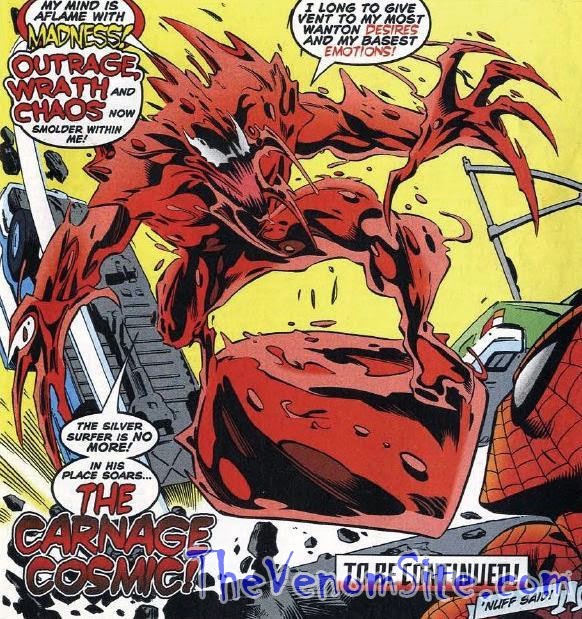 In the comic, Carnage sacrifices his life for Peter Parker—who saw this coming?—by smothering a bomb that would have caused much harm and devastation. It looks like it is the end of Cletus after the panel as Spider-Man only makes one or two comments about the incident. On the cover of the upcoming AXIS #9, we see Carnage once again which leads me to believe he somehow survived the blast. 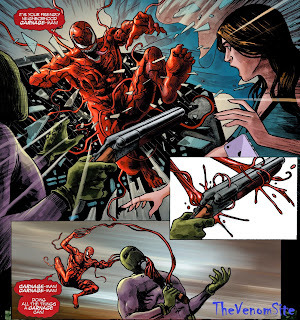 With his new, stronger healing powers, it feels as though Carnage would be one hard foe to take out. After surviving being ripped in half and thrown into space and returning, to becoming lobotomized, and even dying, the symbiote keeps re-emerging and bringing Cletus back to life. One can only hope that this isn't the end for our symbiotic maniac. 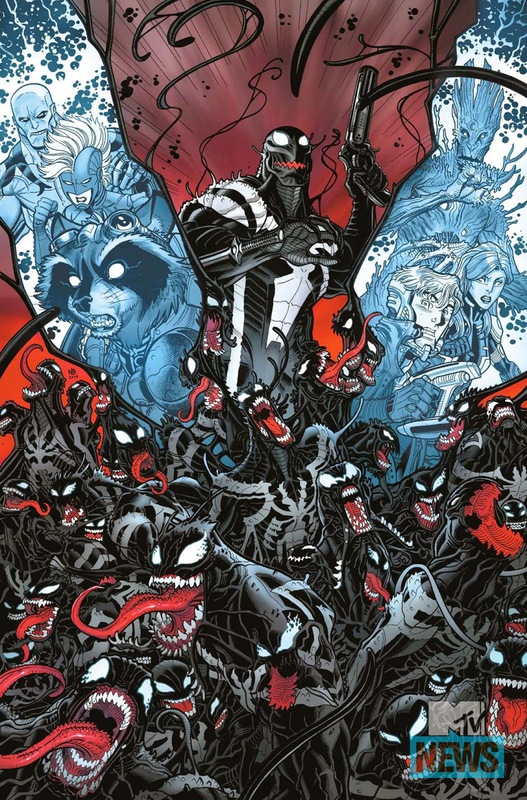 The death of Cletus would go on to hurt a lot of our fans, but with the switching of characters as of late with Wolverine, Captain America, and Thor, it wouldn't be a surprise to see a dramatic change of character in a symbiote as well. 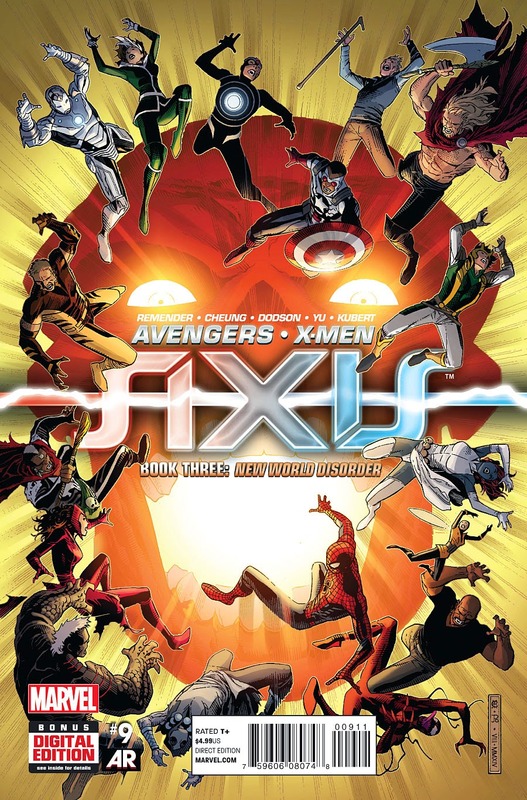 Check out AXIS #9 next Wednesday to find out the fate of the friendly neighborhood Carnage-man. Finally, we see Carnage make a brief appearance in Nova #24. Nova had successfully driven off Kluh (don’t ask) and Cletus stops by to congratulate Nova and wants to know if he can be of any help. Sam asks Carnage: “Are you one of those other Spider-Men that’s running around?” I’m surprised Nova hasn’t heard of Carnage before, but the jab that Carnage or any other symbiote aren’t involved in Spider-Verse hurts even more. Cletus leaves just as soon as he arrives and vows to “help” Nova later on back at his run-down apartment while looking over his old kill list. 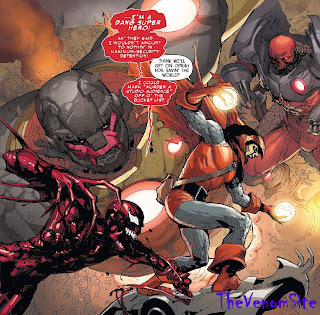 Carnage is set to appear in Nova #26 and #27, so this interaction was meant to serve as setup, but so far from the solicitations we aren't able to figure out if Carnage will be free of his inversion or not. Now that I’ve covered the minor appearances, let’s take a look at the main attraction, AXIS: Carnage #2. The last issue left off with Carnage “rescuing” a news anchor named Alice (who had her hair dyed on the issue cover from blonde) from the Sin-Eater so that she can help him become a hero. I have to applaud the opening pages as they give a rundown of Cletus’ origin as a young orphan boy and how it also manages to keep it somewhat vague as Cletus has a tendency to “remember things wrong sometimes.” This opening scene reminds me of one particular moment from Venom: Dark Origin where Eddie is deciding whether or not to accept the symbiote and the symbiote shows Eddie visions that meld the symbiote into past memories of his own. This issue is just as crazy as the first in terms of how Cletus goes about protecting people while also trying to listen to Alice’s advice and avoiding getting her hair wet in the process. There’s even a moment where you can’t help but feel bad for Cletus as he knows he’s killed a lot of people but is honestly trying to make up for it, besides the fact that he’s only acting this way due to a magic spell. If I had to give one minor complaint about this issue, it would have to be Emil Gregg’s cameo. 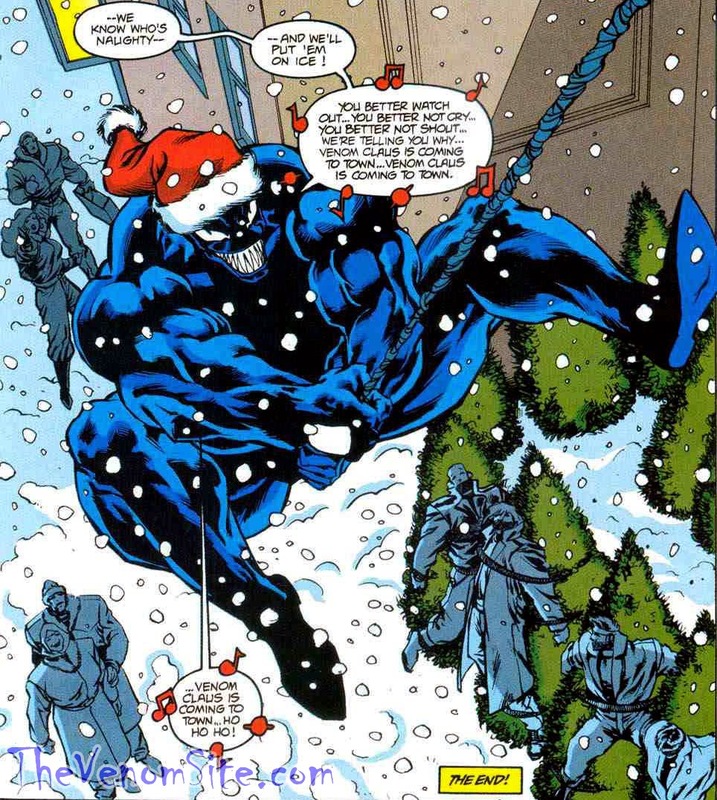 Gregg was the man that believed he was the Sin-Eater and revealed this information to Eddie Brock—which would later play into him becoming Venom—but Gregg was shown to be shot and “seemingly” killed in the mini-series Venom: Sinner Takes All. After his cameo appearance in this issue, it’s a pretty moot point and can easily be brushed off. Even Carnage knows how to catch falling women, c'mon, Spidey. What are your thoughts on Carnage's part in the AXIS event? How do you like his treatment in his solo tie-in book? Let us know in the comments section below and make sure to follow A Dose of Venom every Friday for new content, as well as The Venom Site for all of your symbiote news, reviews, and point-of-views. Is the Marvel WOH What If? Venom Card Unreasonably Priced? As Marvel War of Heroes starts to dwindle in popularity, the prices of cards continue to increase. The ridiculousness of some of the values of the cards leaves one wondering if, to keep up, they need to sell a organ or dip into life savings. The values of some cards can go all the way up to over $1,000 and the end of the card game is nowhere in sight. A few months ago they introduced a new level of cards called Ultra Legendary, which made the regular market plummet but the ceiling for prices increase. Also with the addition of Odin Decrees, regular cards can be boosted to new attack/defense levels but leaves the chance of theft high because you cannot trade these boosters and are forced to trade your card to a sometimes unknown seller for them to boost your card for you. The company who created the app for smartphones, Mobage, is usually not known for being very customer-friendly, but is innovative in the ways of business. With prices ever increasing, this makes it very difficult to acquire desired cards. Two new cards in particular, What If? Spider-Man and What If? 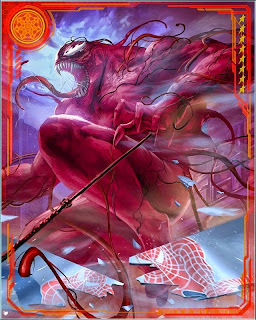 Venom, are the new releases in the card pack known as What If? 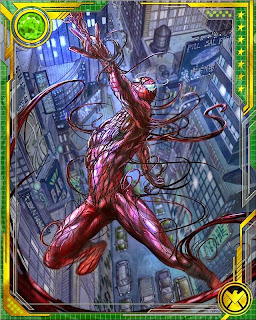 These new cards seem to be every symbiote geek's who play the game fantasy, but is the price point on these cards hurting Mobage or embracing the business for them? The two new cards vary in price due to their rarity. The new What If? Spider-Man is valued around 1200 Power Packs—the currency used outside of card packs in Marvel WOH—and this roughly translates to around $240. The What If? 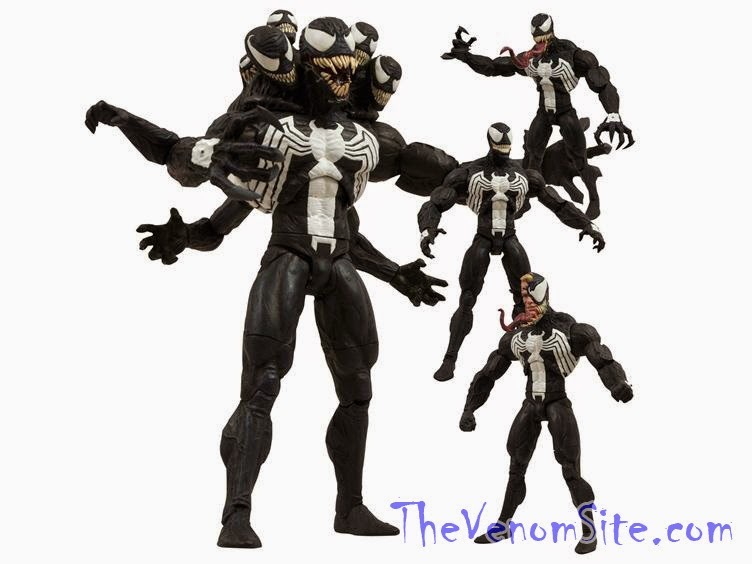 Venom is so hard to find that I could not even find an official price point for it, but it is well over the 3k mark of Power Packs—or $630 dollars. These cards leave the average player high and dry. Hoping and wishing for an incredible pull in a free ultimate card pack is almost futile as the drop rates are low. These cards seem mythical, but who really decides the price points? No one knows, but the people willing to pay these high prices for a digital card with no physical copy leave us stuck in these high markets. To those with the wealth to spend this much on a cyber card deck, congratulations; but to the common working class, this seems impossible. What are your opinions on Marvel WOH? 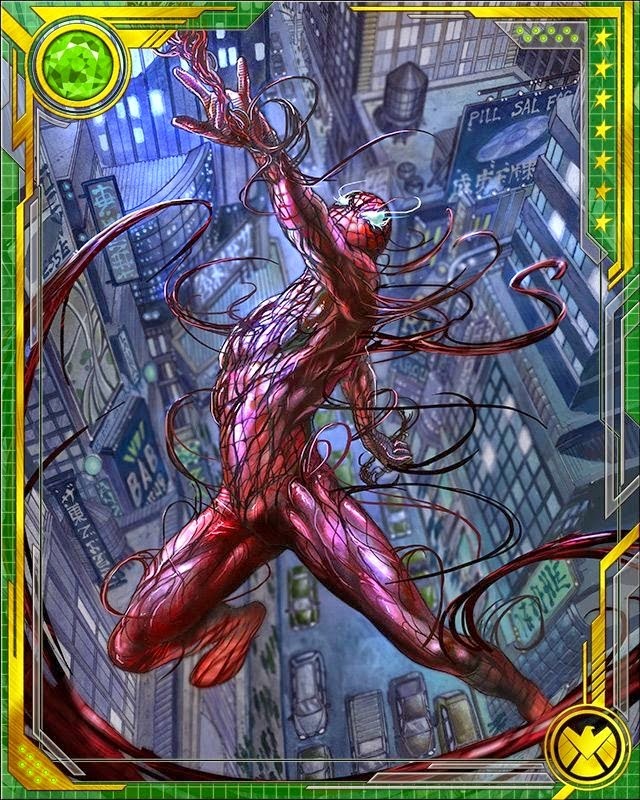 Which symbiote cards do you play with, and which ones are you willing to pay for? Let us know in the comments section below and don't forget to follow A Dose of Venom for new content every Friday. 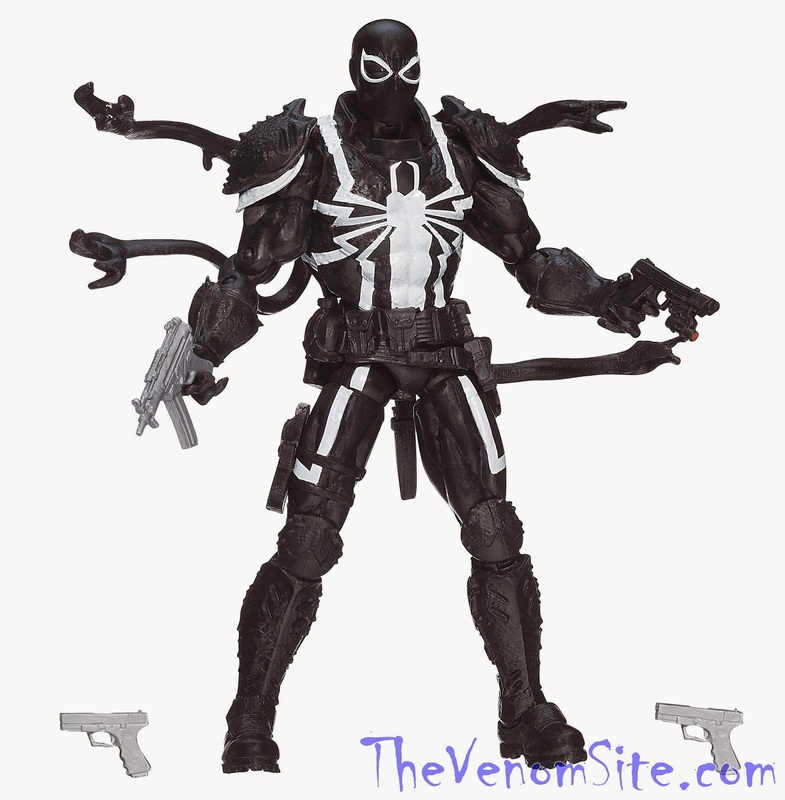 Also, if you're looking to get a free Marvel Legends Agent Venom action figure, check out our Symbiotic Holiday Giveaway and enter for a chance to win before November 30, 2014! 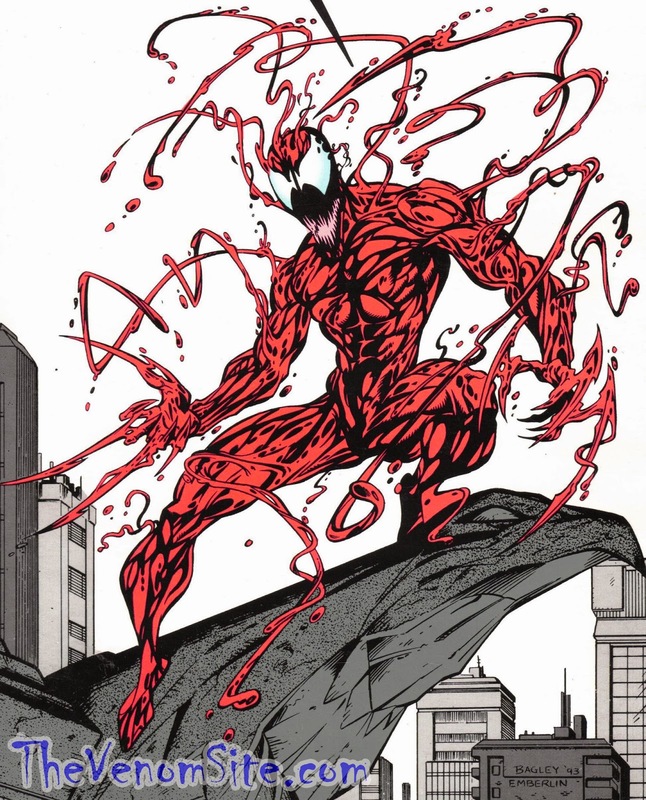 Ever since the red symbiotic psychopath returned from his extended vacation in space, Carnage has been pretty busy in the comic world with multiple miniseries and appearances. The most recent event we find Cletus Kasady being tangled up in is AXIS. 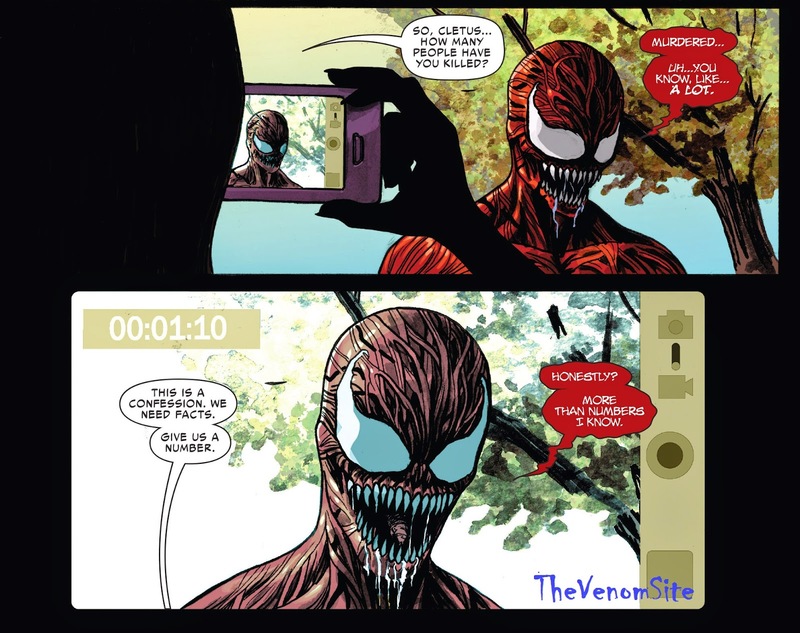 Marvel has gotten a lot of flak from fans with their overuse of huge events like this as of late, but since Carnage is involved, I felt pretty obligated to check it out, so let's discuss what Kasady and his symbiote pal have gotten themselves into now. Carnage makes his first appearance at the end of AXIS #2 with Magneto and his team of baddies (and Deadpool), but Magneto #11 elaborates on just what the heck Cletus is doing playing team-up. Right off the heels of Deadpool vs. Carnage, Magneto finds Carnage sulking about how chaos is nothing but lies, but Magneto convinces him to join his team of villains to defeat Red Skull because what would be more random for Carnage than becoming a hero? The action picks up in AXIS #3 with Cletus joining villains like Jack O' Lantern, Hobgoblin, and Absorbing Man in an attempt to take down Red Onslaught and two giant, adamantium Sentinels that are programmed to target heroes, giving the team an edge. There's some funny banter between the villains who at a second's notice would be at each other's necks if it weren't for the colossal Nazi clone with the brain of a telepathic mutant trying to take over the world. 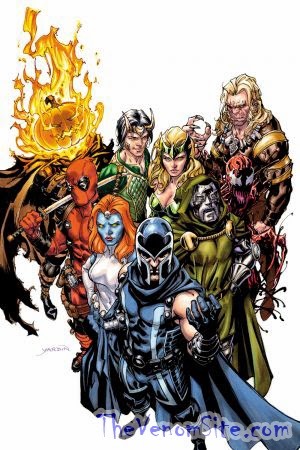 All seems to be going well until Doctor Doom and Scarlet Witch cast a spell that is intended to bring Xavier's consciousness over Red Skull's with the spell covering all of Genosha. 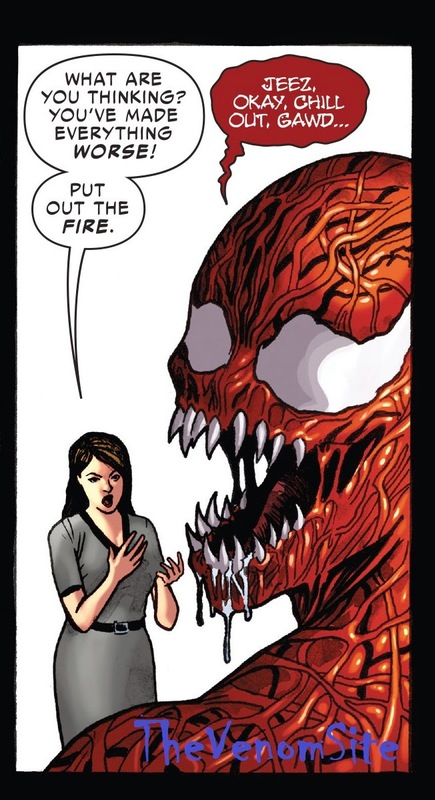 And that is how we get to Carnage's most recent miniseries, AXIS: Carnage. The interior art is done by Germán Peralta and Rain Beredo, and the story is written by Rick Spears who (I remember from an interview) had stated that he does not like writing serial killers, so I thought of him being a writer for a Carnage book of all things an odd choice, but that was before I had known how brilliant and hilarious the book would be. Sometime after the spell is cast on Genosha, Carnage and Deadpool give a disturbing, out-of-character friendly greeting to each other in Deadpool #36 before Carnage returns to New York for the miniseries' first issue. Without wanting to give away too much of the story's plot, Cletus has been affected by the spell and is now forced to be a hero, but focuses his homicidal urges to serving justice—something very reminiscent of Venom in Venom: Lethal Protector. The premise alone is a funny concept that breathes new life into a character that many people consider a painful relic of the '90s or a one-trick killer pony with no character depth, granted these are some traits that I and a multitude of others like about the character, but I'm not here to judge. The story also introduces an all new Sin-Eater—the villain that indirectly created Venom—who has a much more literal and spooky side to him now. 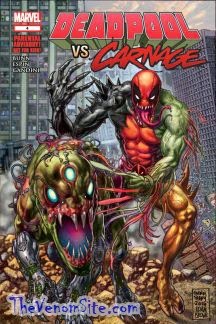 All in all, AXIS: Carnage #1 is a gory, fun, and entertaining read that Carnage fans are sure to enjoy, but even if you aren't a Carnage fan, this issue might win you over to “Carnage-Man.” Be sure to join me next time where I catch you up on all the carnage going on in AXIS and AXIS: Carnage #2! What were your thoughts of the inverted Carnage? Would you mind seeing him being a hero for a while longer after AXIS? Let us know in the comments section below, and keep following A Dose of Venom for new doses every Friday! 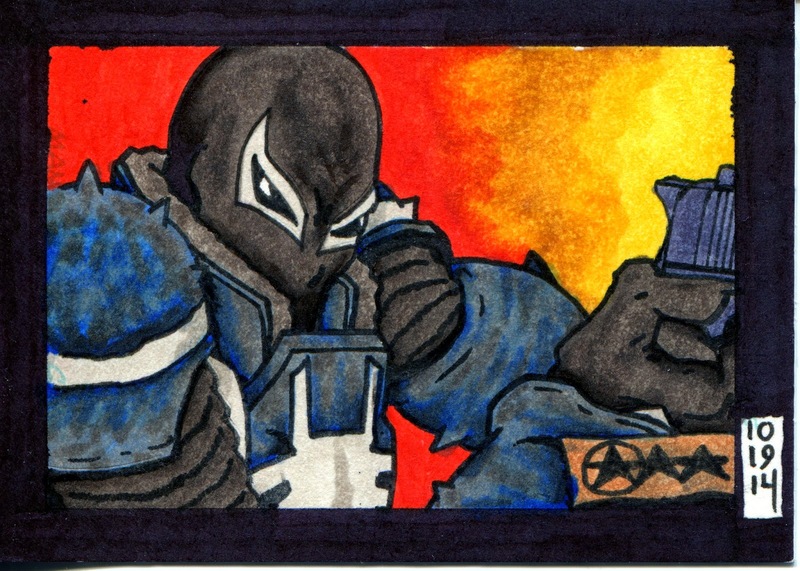 Welcome to a new segment here on A Dose of Venom in which Venomaniacs review and report news about symbiotic activity in the realm of video games. 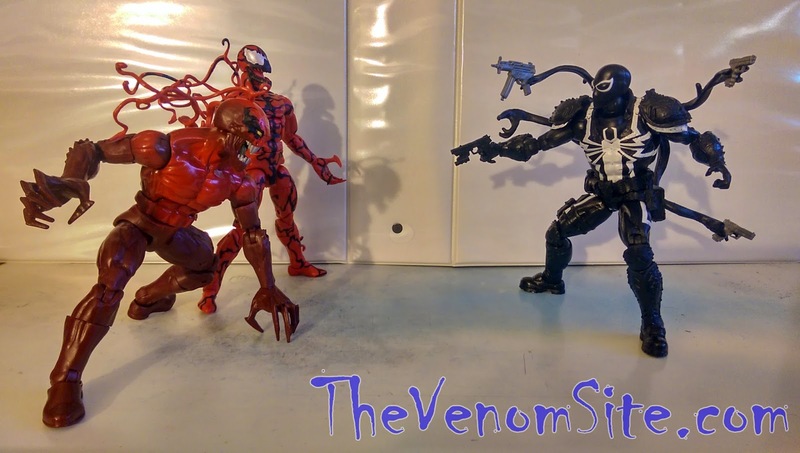 If you like to play games and you're looking for some new titles in which you get to play with, against, or as Marvel's symbiotes, then this is the segment to follow. For the first installment, we're putting the spotlight on Marvel's most ambitious gaming venture yet: Gazillion Entertainment's Marvel Heroes 2015. Available on PC, Mac, and through Steam, Marvel Heroes 2015 is the lovechild between Diablo and Marvel: Ultimate Alliance. There are two features that sets the game apart from its competition—DC Universe Online and Champions Online: first, it's not a traditional World of Warcraft-style MMORPG (massively multiplayer online role playing game); it's actually an MMOARPG, which is slightly different in that the play style is top-down with mouse-intensive action, much in the way of Diablo II (from which it borrows some of the classic game's developers). Second, players don't get to create their own unique hero or villain characters to interact with the copyrighted intellectual properties; instead, players can play as their favorite Marvel heroes and villains from comic book lore and can completely customize the clones with gear, powers, and alternate costumes until they are unique within and of themselves. Gazillion has been doing a bang-up job with frequently releasing new game and system updates, and has even managed a new stride of introducing one new playable character each month. 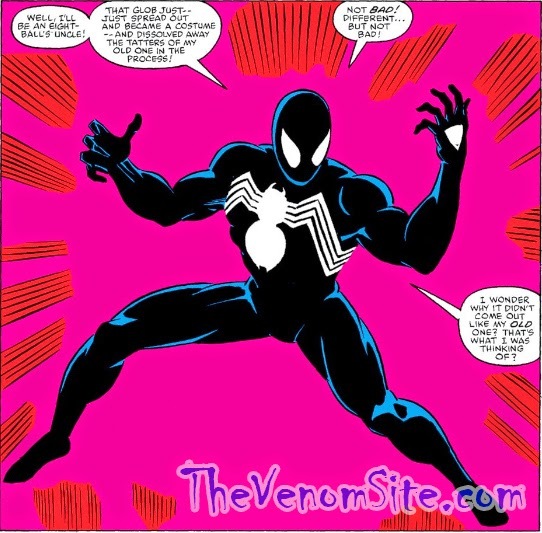 As of yet, there has only been one playable symbiotic character: Spider-Man with his enhanced Symbiote costume (which includes a special voice-over by the Peter Parker of the '90s Spider-Man: The Animated Series, Christopher Daniel Barnes, plus special cosmetic powers). Don't hold your breath at getting your hands on this costume, though, as it was exclusive to the $199.99 pre-launch Ultimate Pack. 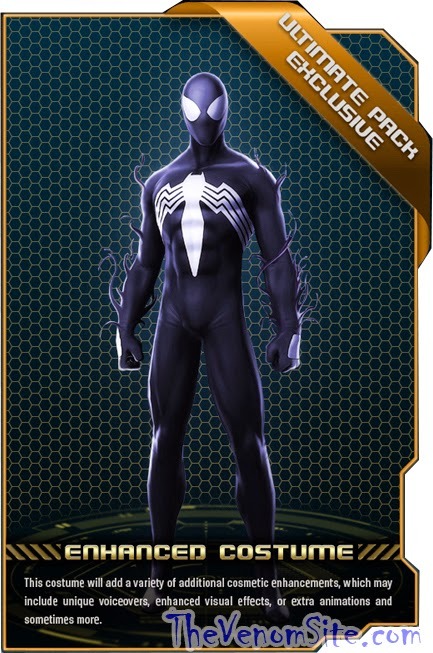 You can get its non-symbiotic brother, the enhanced Back in Black costume (which also has a Barnes alternate voice-over) for 1,250 Gs (account currency; $1 = 100 Gs), but that's just the cloth version of the famous symbiote costume, so there are no symbiotic cosmetic powers. 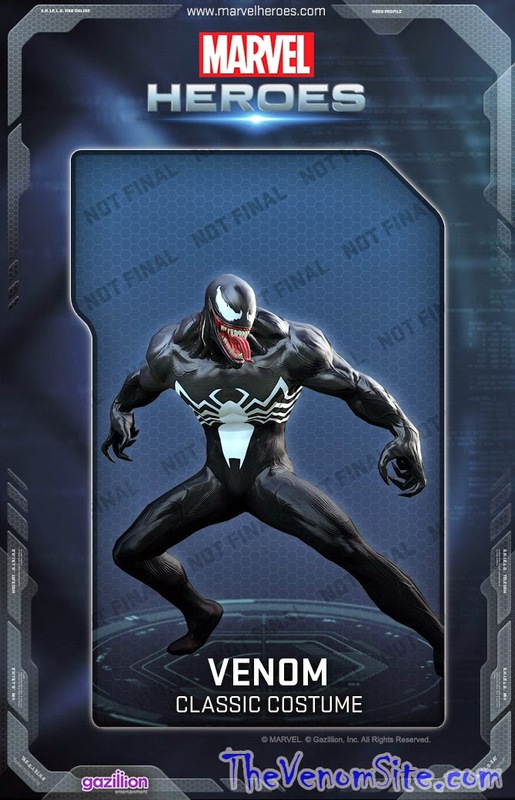 Don't be down, though, if you missed out on the Symbiote costume because a playable Venom (Eddie Brock) character is slated for a pre-New Years 2015 release for an estimated 600 Eternity Splinters (an in-game randomly dropped currency). 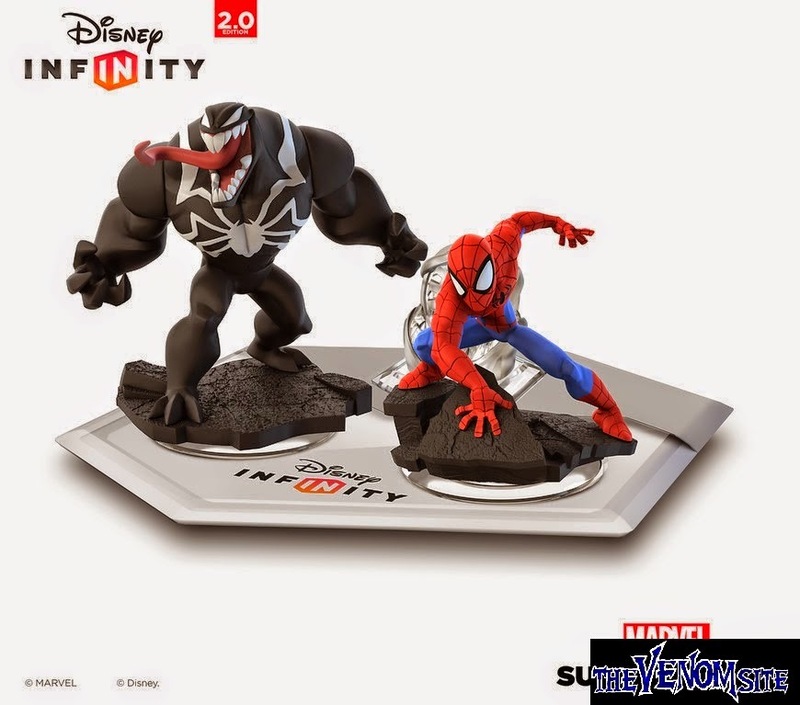 There are no details as of yet about his powers or alternate costume, but if you feel like getting the full Venom experience out of Marvel Heroes 2015, then head over to its online store and pick up the "Bring On the Bad Guys + More Pack" to pre-order Venom along with Magneto and the Juggernaut (plus getting the already-released Mr. 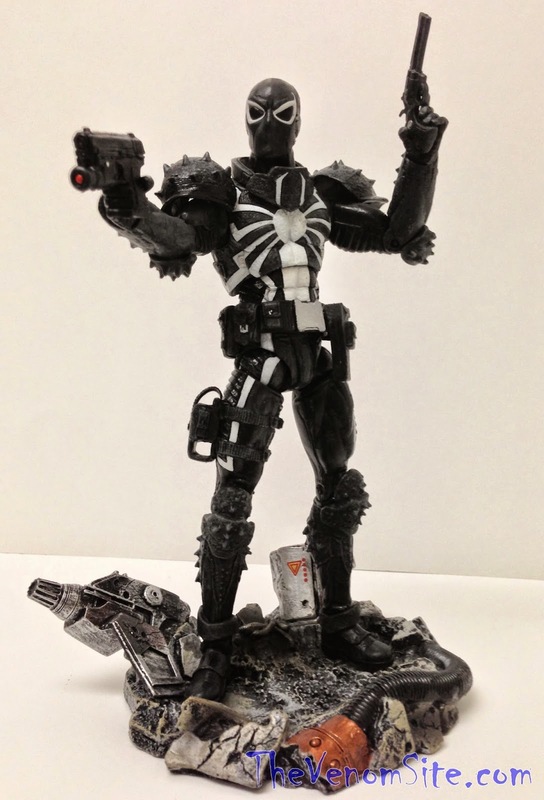 Fantastic, Star Lord, and Rogue), or you can wait until Venom's release date approaches to preorder his solo Hero Pack for $17.99, which will come with the alternate costume, Venom's own unique Hero S.T.A.S.H. (an in-game inventory storage container), and a few other in-game goodies. On the off-chance that you're interested in getting just the character by himself (why wouldn't you want all that swag?! ), there's a way you can get him for FREE, essentially. Log on or create an account (it's a Free-to-Play game!) at least a month or more before his release (just to give yourself some time) and play the game. By completing the entire story mode (up to defeating Doctor Doom) on the first go-around, you'll automatically receive 200 Eternity Splinters. Then all you need to do is continue grinding the game for Eternity Splinter drops, especially in PvE instances like Midtown Madness or the S.H.I.E.L.D. Holo-Sim. Luckily, the drops aren't the most uncommon in the game (Gazillion ranks the random hero or costume drops as the rarest of all). You can then purchase Venom from the in-game Eternity Splinter Vendor in the player hubs when he comes out, and the player community estimates that he'll cost 600 splinters. Sorry for the low graphics quality. My graphics card isn't the best. If you can't wait to play as Venom, though, you can always fight against him. Venom first shows up as a non-interactive NPC during the Raft breakout tutorial zone as you get to watch Eddie take advantage of the breakout to rebond with the symbiote and escape. 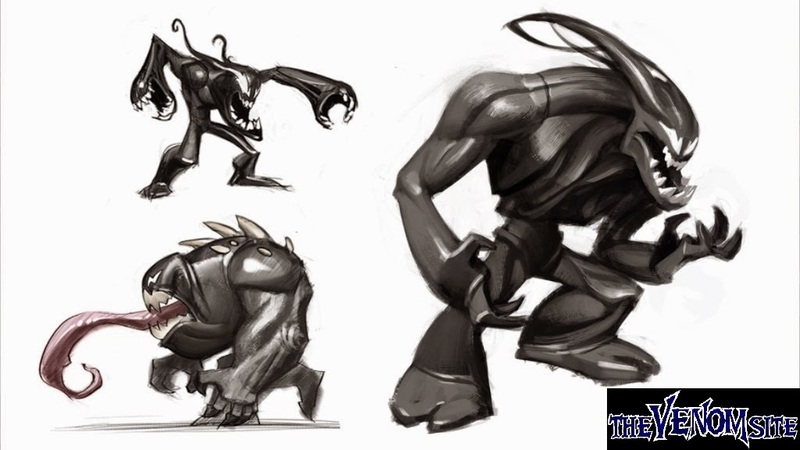 Then in Chapter 1, if you head into the Police Station in the open Hell's Kitchen map, you'll trigger the "Symbiote Infestation" mission in which you see yet another brief cutscene of Venom making his escape to leave you with symbiote-infested civilians. After that, you can fight Venom as an instanced boss in the Storage Yard of Chapter 2 and in Midtown Manhattan, and as a special boss fight in the S.H.I.E.L.D. Holo-Sim. Take it from a fellow Venomaniac: it's very satisfying to fight him. 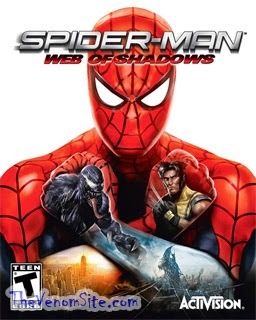 As one last note, you can get a summonable Team-Up Hero of the Back in Black (non-symbiote) Spider-Man to fight beside you in battle, but there is a rather expensive catch: you can only attain him through the Mark VI Fortune Cards (100 Gs each) as either a rare drop or from collecting 95 Armor Tech Blueprints (with a 1:1 drop ratio per Mark VI Fortune Card)—so that's either a $95 purchase or a really lucky Fortune Card. Yeesh. 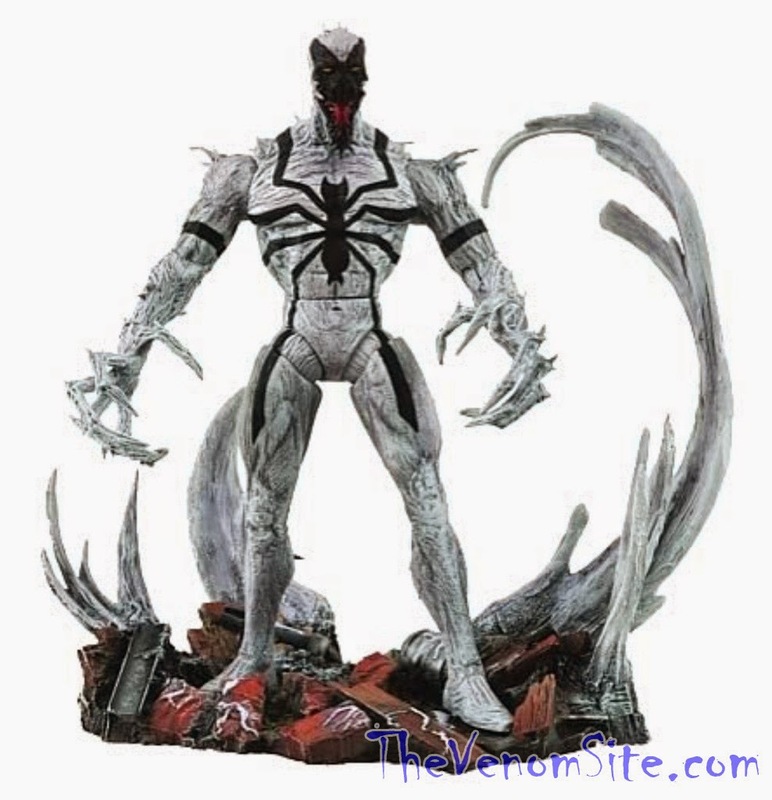 That's all of the symbiote goodness Marvel Heroes 2015 has to offer right now. 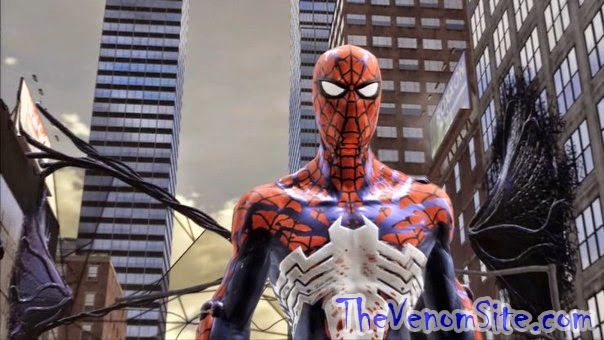 Only Venom and the Symbiote Spider-Man costume are the symbiotes currently featured in the game, and there is no ETA on any other symbiote character cameos. Still: when Venom finally arrives as a playable character, it's going to be EPIC. Sound off below! Will you be getting Venom when he becomes available? Were you one of the lucky few to purchase the enhanced Symbiote Spider-Man costume? 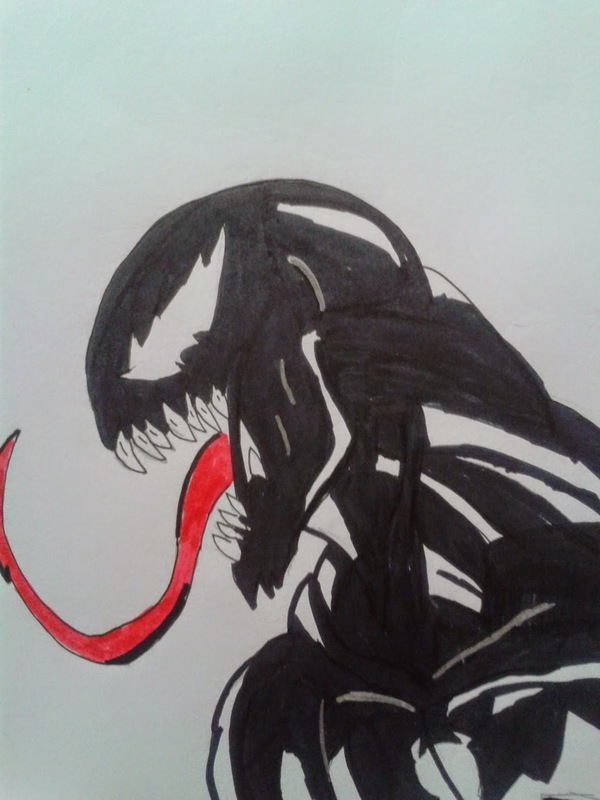 What do you think of Venom as a boss in the game? As always, check back every Friday for a new dose! Alex Kutzman, the writer and director in charge of Sony's Venom Carnage (currently running title) spin-off film within its Amazing Spider-Man franchise, talked briefly with MTV on Wednesday about the highly anticipated/dreaded project. As always, it seems, Kurtzman knows how to viciously tease Venomaniacs and Spider-Man filmgoers with paltry tidbits of vaguely important information on the project, and never answers any of the important questions. 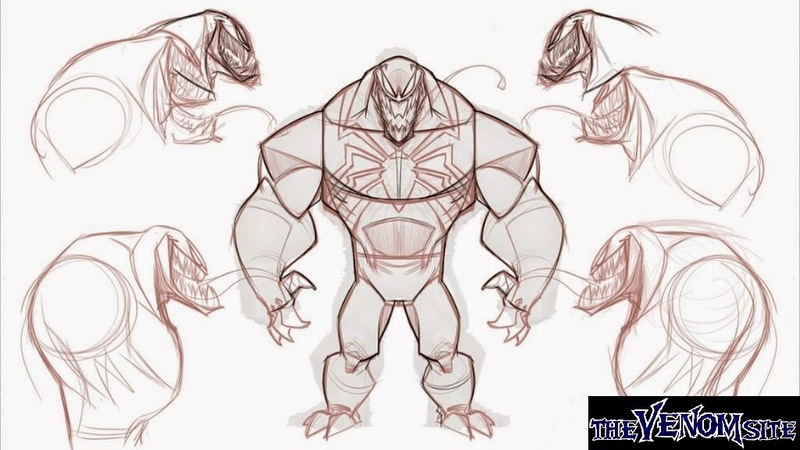 This time around, Kurtzman speaks in general about the tone and goals of the spin-off film, lending little to no leeway on revealing whether Eddie Brock or Flash Thompson will play the title protagonist. "The idea," Kurtzman explained, "is that you can do things with Venom that you can't do with Spider-Man…Venom is the representation of every line that will get crossed…He's a much darker character." 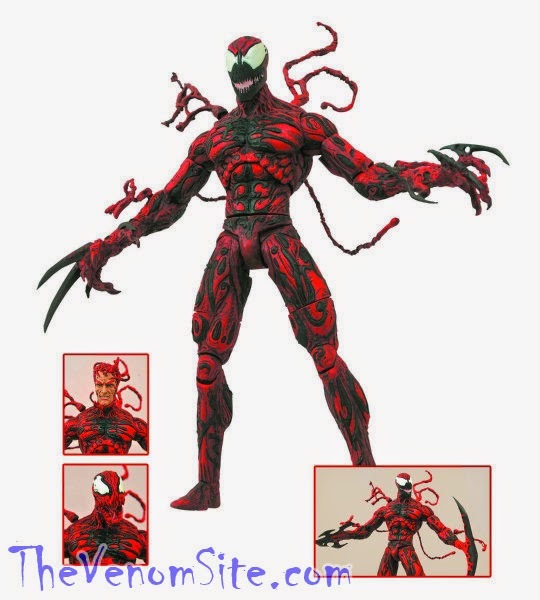 Okay, so Venom Carnage is going to be a darker, edgier film than its predecessors. Good news, right? Well, it would've been better if he mentioned whether it will challenge the consistent PG-13 ratings of the rest of the Spider-Man films throughout the years, which would give us a clearer idea of which iteration of Venom we'd see on the big screen. 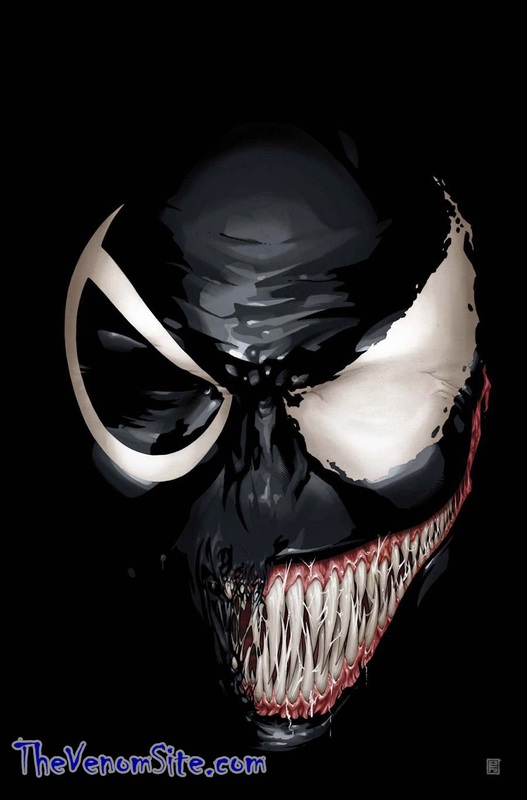 Thanks to KDrama Stars (curse that site), Brock fans received an unpleasant scare when, on the same day MTV posted Kurtzman's announcement, it announced that Chris Zylka was rumored to return as Thompson to play Venom in Venom Carnage while Brock may be reserved for a cameo in Amazing Spider-Man 3. Now, before anyone else goes jumping to conclusions, let me reassure you that KDrama Stars is merely rumor-mongering with that article. 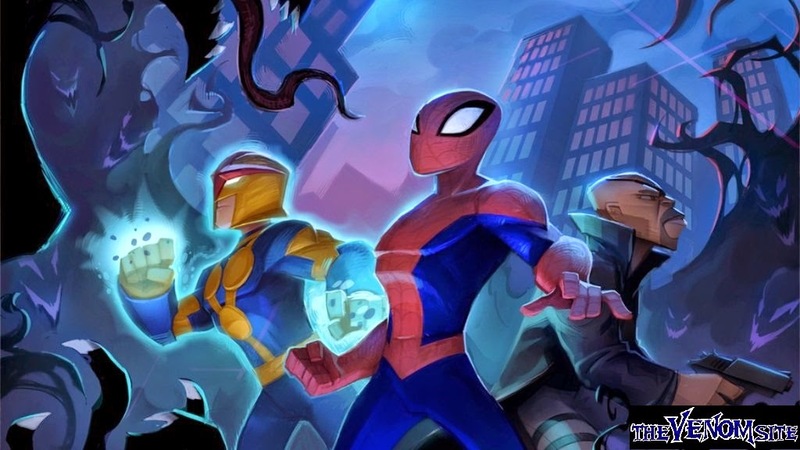 The author claims that ComicBook.com had reported the original rumor, but after doing a little digging myself, I found no such rumor floating around at ComicBook.com, much less in an official blog post on the site. Yes, that means Mingz Pao, the KDrama Stars author who purported the rumor, created it himself and falsely sourced ComicBook.com as the rumor's originator. False alarm, Venomaniacs: this is just another case of bad journalism. So to recap, just about nothing new has been reported regarding Venom Carnage this week. Kurtzman let us in on insider info anyone could have guessed and KDrama Stars lied about casting to get us all worked up. Y'know, standard Venomaniac fare. Comment below about your thoughts on the news and follow A Dose of Venom for new articles every Friday. 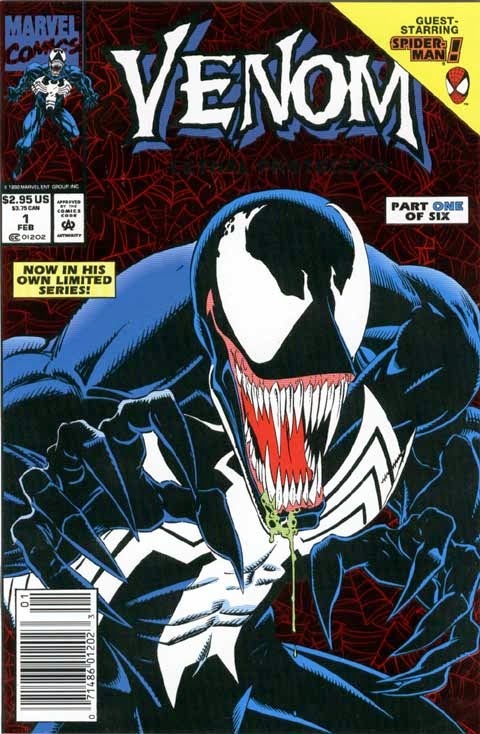 Ever wondered what the truth was behind the symbiote we now know as Venom's story in Marvel Superheroes Secret Wars? A machine that was used to fix suits and create different material objects was also home to a parasite we know and love, but could it have been a costume from a previous owner? Could it have been a scientific manipulation of the symbiotes' very existence?! The issue that introduced it all in the May of 1984 (The Amazing Spider-Man 252) had a cover which left most in wonder of what exactly Spider-Man was wearing and where it came from. 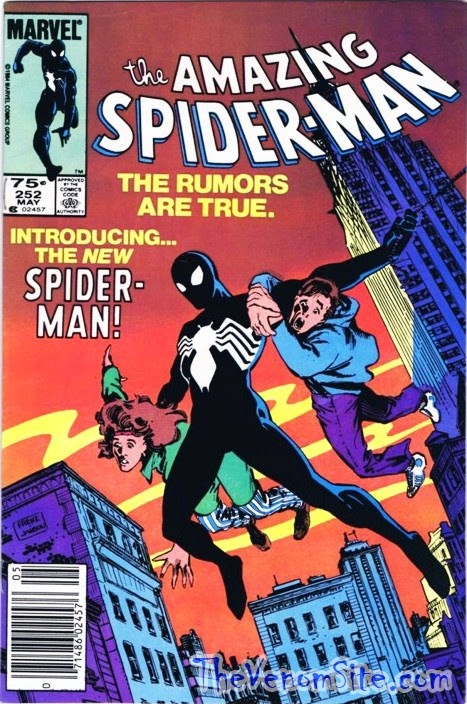 Spider-Man was getting a revamp in the mid '80s with new and exciting stories and. most of all. new threads and powers. The suit gave Spider-Man enhanced abilities and allowed Peter to accomplish things he could not imagine. 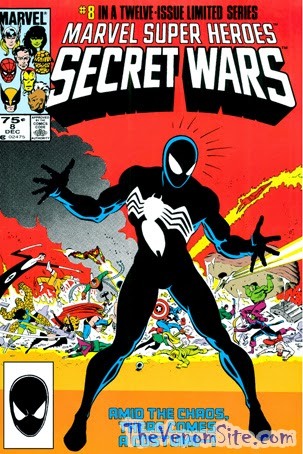 In 1984, after the release of this land mark issue, started an event by Marvel simply known as Secret Wars. Little did the Marvel world know that this series would eventually go on to explain where the black suit had originated from only a few months later. In this random origin story, a long battle takes place between Earth's Mightiest Heroes to defeat the likes of Doctor Doom, Doc Ock, Galactus, Enchantress, and many more. A war has erupted on this mysterious alien land and "Amid the Chaos, there comes a costume!" After losing his helmet and ripping his costume in battle, Thor visits a machine which replaced his costume. 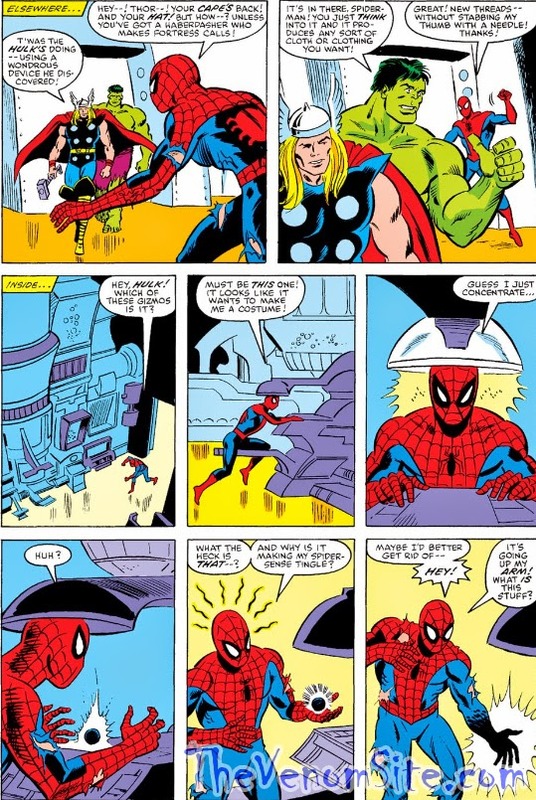 Spider-Man notices his own suit being shredded, so after talking with Thor, he learned to use the mysterious machine to fix and replace pieces of his outfit. What came next was of complete mystery to the web head and thus the symbiote was born. Now for some clarity, this machine was home to what we now know as the Venom symbiote, but what exactly was the symbiote doing inside the machine and how did it get there? Some ideas I have come up with may shed some light on the whole situation. Is it possible that the symbiote had somehow managed to trap itself in the machine? It could have very well accidentally stumbled onto this alien world attached to a ship and found itself waiting for its next victim to latch onto and bond with by hiding within the machine. 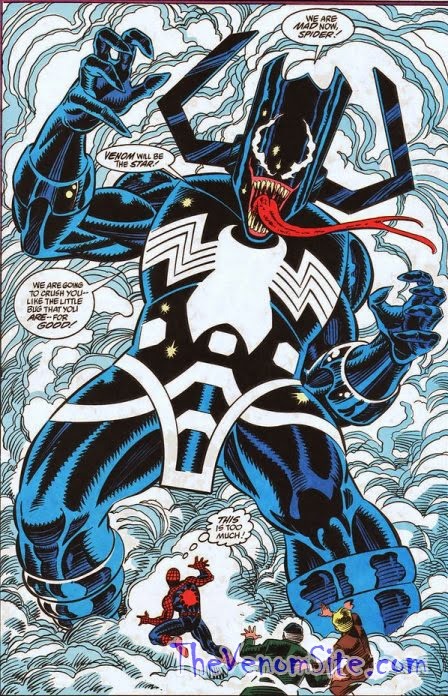 For scenario number two, could the symbiote have been attached to a previous host who brought it here and this was a alternate costume for the individual? The idea that it could be the Beyonder's secret suit or weapon is plausible, in which he scientifically broke down the uses for the symbiote and learned to somehow control it. 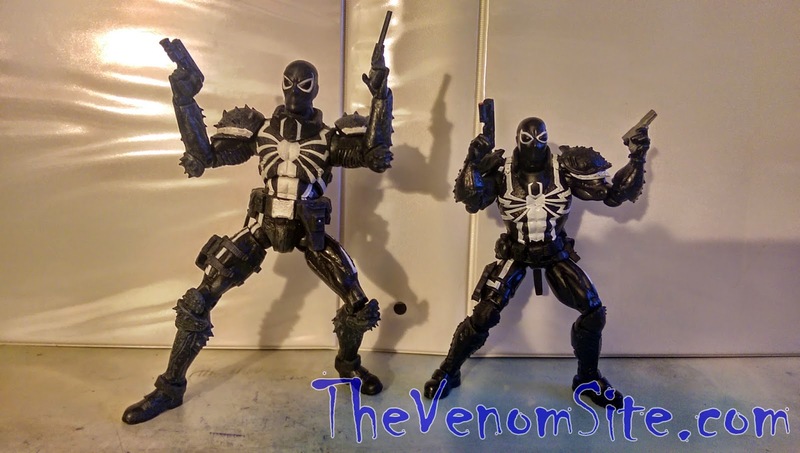 Does the Venom symbiote have a more involved past than we thought? Finally, could it have been a project that was being worked on to develop weapons and create new matter through manipulation? The symbiote has the power to shape-shift, so why would an economical use for it be unlikely? This leads me to believe also that there could very well be more of these machines and civilizations using symbiotes to develop their armies and/or worlds. 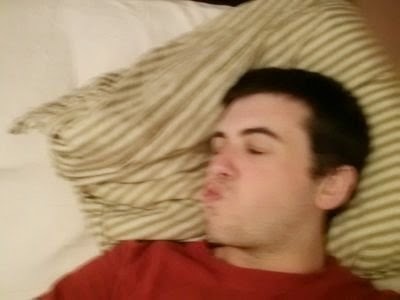 What can you conclude from this? Have some ideas on his origin of your own? Feel free to share in the comment section and let me know some alternate ideas for where this story of the machine was going.